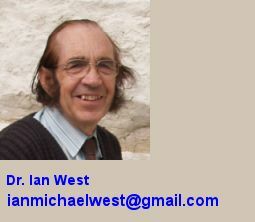 West, Ian. M. 2017. Withies Croft Wall; Geology of the Wessex Coast. Southampton University. Internet site: www.southampton.ac.uk/~imw/withies.htm. Version: 18th June 2017 (original version in 2003). 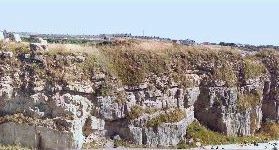 In the northern part of Portland, between the Verne Fort and Easton are the old Withies Croft Quarries. At the southeastern limit of these the old quarry face has been left up to the date of study (1998) as a relatively narrow wall, referred to here for convenience as the "Withies Croft Wall". This old aerial photograph (1972), modified from an illustration of Morris (1990), shows the location of the feature in relation to the major landmarks of the northern part of the Isle of Portland. There have been many changes on Portland since this photograph was taken, in particular the development of a large and deep quarry northeast of the wall. For more details and other Portland photographs refer to Morris (1990). After the study in 1998 this wall was blasted and quarried away. The purpose of this report was to make a permanent record available for reference after its destruction. Neighbouring exposures of the Portland and Purbeck Formations are not very different, and this webpage may serve as introduction to them. Differences in detail and small differences in thickness are likely though. These photographs show the state of the wall on the 7th August, 1998, prior to the effects of road-making and quarrying activity, which later destroyed the wall. On top of this residual wall of Portland and Purbeck strata there was in the past also an artificial wall that marked the northwestern boundary of a convict prison quarry on the other side. There was in addition a lookout post. The remains of a lime-kiln associated with the prison quarry survives nearby. An image above shows the most north-easterly part of the Withies Croft Wall which still shows a clear section of the strata. The bank beyond is quarry debris. The road level is relatively high here and only the Whit Bed and Roach of the Portland Stone are visible, together with a basal Purbeck succession. The Purbeck Caps, Dirt Beds and some of the so-called "slatt" ("Cypris" Freestones) is exposed. Part of the Purbeck succession had been removed by the date of the photograph, leaving a surface at about the level of the Great Dirt Bed. The image to the right of this is a continuation to the west. The third and lower right image shows a south-western part of the wall. The road, heads north-eastward from the Independent Quarries of Albion Stone. It is at a lower level here than in the north-eastern part and thus chert and the underlying Base Bed (or Best Bed) is also exposed. BDB = Basal Dirt Bed; LDB = Lower Dirt Bed; GDB = Great Dirt Bed (with limestone pebbles in grey marl - a palaeosol). The fourth image is a continuation almost to the south-western limit of the wall and the edge of Independent Quarries. All these photographs were taken on the 7th August before the major quarrying of the wall commenced. Behind the wall were part of the original Admiralty Quarries in which convict labour was used to obtain stone for the breakwaters of Portland Harbour. The old convict workings were still there in 1902 as shown on this old map. Note the rail tracks and the positions of the look-out posts. It seems that two such posts were originally on the Withies Croft Wall. This classic diagram, based on Arkell (1933) shows the general uppermost Jurassic/basal Cretaceous succession in the Isle of Portland, compared with that on the Isle of Purbeck. The Isle of Portland is mostly composed of Upper Jurassic marine strata with a small thickness of basal Cretaceous Purbeck Formation. The Upper Jurassic, Kimmeridge Clay occurs beneath Portland Harbour and Castletown and is under the foot of the high northern cliffs on both sides. The Portland Sand, which is, in fact, largely marls with some sandy horizons, lies above. The Portland Stone consists of the Portland Cherty Series overlain by the Portland Freestone, mostly oolitic limestone. The Purbeck sequence follows. In the southernmost part of the Isle of Portland there is a raised beach (or beaches) of Pleistocene age. The terminology of the Portland and Purbeck successions has led to some disagreements. Townson (1975) introduced a largely new terminology. However, it has not been widely used and the traditional scheme of Arkell, shown on the left is the more widely used (diagram after Bosence, 1987, from Townson, 1975). 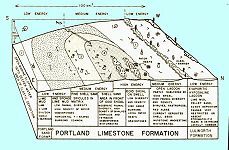 More details on the general geology of Portland are provided in the Isle of Portland Geological Field Guide on the Internet and the general maps and sections are not repeated here. See also the Portland Bill Field Guide. The topography of the Withies Croft Wall as in August 1998 is shown. The main cliff or wall is on the south side of the narrow quarry road. A smaller cliff separates the wall from the terrace to the south. The rock exposures of the wall are in yellow, with grass in light green, bushes in darker green and landfill in grey. The ten metre location stations, shown in blue, are for cross-reference to cross-sectional diagrams and photographs. 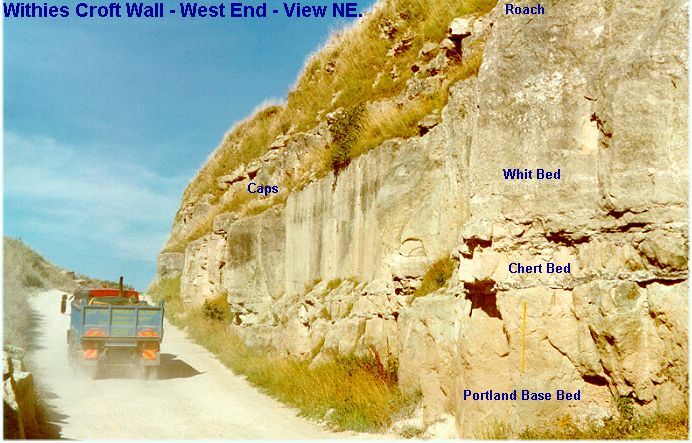 The lower part of Withies Croft Wall consists of the uppermost Portland strata, particularly the Base Bed, the Curf and Chert, the Whit Bed and the Roach. These beds appear almost horizontal on the line of the section, but like most of the strata on Portland, they may dip southward at a low angle. Attached to the Roach is the Basal Mould Bed of the Purbeck Formation, followed by the Basal Dirt Bed, the Skull Cap, the Lower Dirt Bed, the Top Cap and the Great Dirt Bed with pebbles. The Soft Burr is clearly seen above. The Aish and the Bacon Tier are partly obscured by soil and vegetation. This horizontal section is not on a sufficiently large scale to show the irregularities which are features of the basal Purbeck Caps. The positions of the field locating marks (30W etc.) 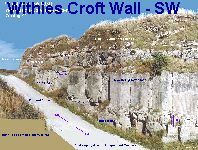 are given and the photographs which are reproduced as various images in this Withies Croft Wall section of the web site will reveal more detail for specific locations on the line of section. See also the eastern end details shown in a diagram below. The east-north-eastern end of Withies Croft Wall in summer 1998, shown as photograph and diagram. The diagram shows the wall at an earlier stage in August, 1998, whereas the photograph was taken on 2nd September when some of the eastern part had been quarried away (an oblique photograph above shows the earlier situation). The wall once extended as a feature even further in an east-north-easterly direction but has been removed in the past and replaced by a bank of quarry debris. The subdivisions of the Portland Purbeck stratigraphical units are labelled here with their traditional names for the Isle of Portland. The Whit Bed is a good oolite, valuable for quarrying. The roach is a shelly oolite, with mouldic secondary porosity resulting from the dissolution of the aragonitic shells. Aptyxiella portlandica is , as usual, abundant in this bed. There is a thin Basal Dirt Bed that was probably an ancient soil. The Lower Dirt Bed is more conspicuous with the lagoonal, hypersaline limestone of the Skull Cap between the two. The Top Cap (equivalent of the Hard Cap at Lulworth and the Fossil Forest) comes next with a parting within it and above that is the Great Dirt Bed with limestone pebbles and silicified coniferous tree remains. The Soft Burr (the Soft Cap of Lulworth) was removed by this date and so, too, was the Slatt (which corresponds to the Upper Broken Beds of " Cypris " Freestones facies). The western end of the Withies Croft Wall is shown as it was on the 7th September, 1998. The left hand photograph which is of the road on the northwestern side shows the position of the main horizons. Because the road descends to the west the Chert Bed and the Base Bed beneath it are both visible. The right hand photograph, taken at the same date, shows quarrying in progress at the small face cut across the western end of the wall (at right angles to the road). Here a pneumatic drill has been used (notice the pipe) to make the small cylindrical holes. 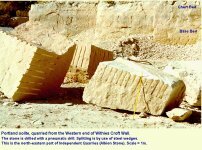 Steel wedges have been driven in to split off the blocks of oolitic limestone. The ammonite shown in the fossil section, below, was seen in one of these blocks. This diagram is a graphic log of 28 beds of Portland and Purbeck strata in the Withies Croft Wall. The succession extends from about the base of the Portland Stone (base of the Base Bed) to the Hard Slate of the basal Purbeck Formation. Details of the beds are discussed below. The Portland Stone succession up to the base of the Curf and Chert has been measured at the western end of the Wall, adjacent to Independent Quarries. A clean section is visible at the end where there has been some initial quarrying. The Curf and Chert were measured from the road on the north side of the Wall in the area of the 30 and 40m. west locations. The section was then continued up at the eastern end, where the chert is just exposed near road level. The succession up into the basal Purbeck Formation was made at this eastern end. The measurements are in general reliable to about plus or minus 2 cm. Repeated measurements were made where there was noticeable lateral variation or some uncertainty. The strata in and around the Curf and Chert Beds show some lateral changes and any error is likely to greatest here. 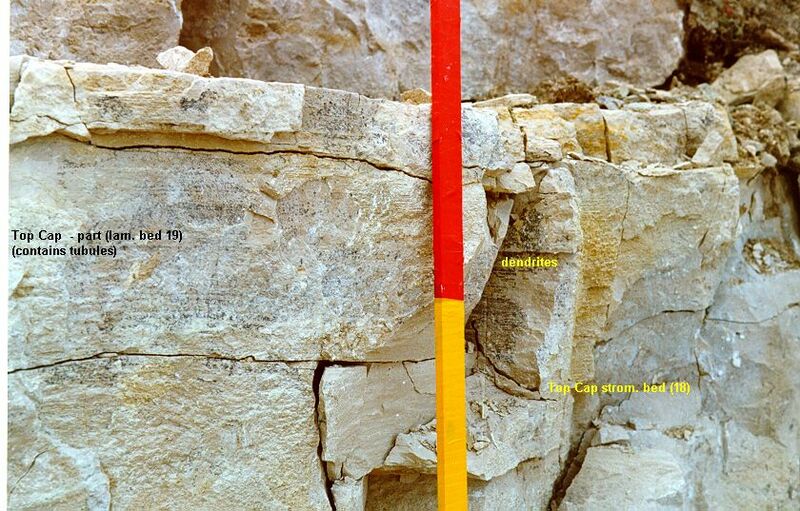 The measurements of the Purbeck strata are accurate but these units show more lateral changes that most parts of the Portland limestone succession. "NP" on the diagram means that there is a transition and no parting was seen. Shingle (lower part). Greater than 1.10m seen (possibly up to 1.5m). Weathered, loosely laminated, limestone. Laminated pelletoidal limestone. Ostracodal near the base. It resembles part of the "Cypris" Freestone facies of the Lulworth area and approximately corresponds in position with the base of this unit. It is probably of similar hypersaline lagoonal origin. Lamination in the Shingle elsewhere is seen to be a ripple-lamination (not climbing ripple, and probably oscillation ripple of 'tidal' flat origin. The Bacon Tier Clay. 0.02m (2cm) or 0.03 (3cm). This is a yellowish brown clay. The Bacon Tier. Initially listed as 0.34m. The surface is weathered and slopes so this is not the ideal place to measure it accurately. A second, later measurement was ) 0.45m. The lower part is harder, particularly the lowermost 0.14m. This bed requires study at a better exposure. Some calcitised evaporites might be present at this level. The lithology here seems to be laminated pelletoidal limestone, but pseudomorphs after gypsum have not been searched for. 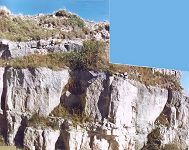 This is a major horizon of evaporites at Perryfield Quarry (West, et al., 1969) on the Isle of Portland, further south and at the Fossil Forest and elsewhere in the Lulworth area (West, 1975). . The Aish Clay Bed (new name). 0.025m (2.5cm) - 0.03m (3cm). Weathered grey marl with iron-staining. Here this is a grey and earthy appearance. The Aish. 0.815 m. Laminated and pelloidal limestone. Weathered and brownish in colour. It is easily accessible only towards the eastern end near the clump of ivy at about location 15 m E on the horizontal section. It is near the top of the bank, not in good clean condition and not easy to measure precisely. A better study of this bed could be made elsewhere in a new quarry section. At about this level or that of the next limestone above some calcitised evaporites should be expected. The Aish Bed can be subdivided here as follow: (WCW 24a) At the base is 0.30m of laminated limestone. (WCW 24b) Then above comes 0.025m (2.5cm) of brown laminated calcareous clay. 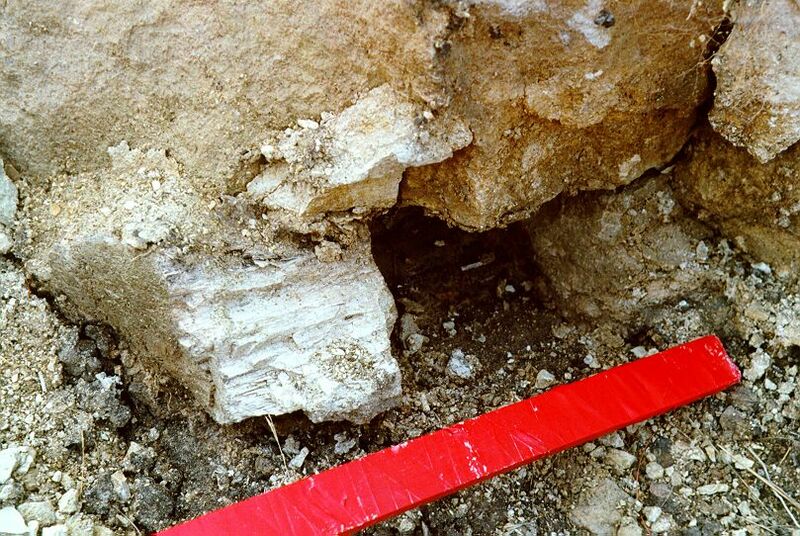 (WCW 24c) The uppermost part consists of 0.49m of laminated limestone. The Soft Burr. 0.29m. Brown weathering stromatolitic limestone of thrombolite type. It is mostly massive but the uppermost 0.02m are laminated. It domes to some extent over silicified trees, although not as obviously as the equivalent Soft Cap at the Fossil Forest, Lulworth. The Great Dirt Bed. About 0.27m thick but variable to some extent. This is a palaeosol, a carbonaceous marl with subrounded pebbles of limestone. The pebbles usually consist of limestone types similar to those in the underlying Caps and although pebbles from here have not been thin-sectioned they appear similar to those elsewhere (and not Portland Stone). A proportion of the pebbles are blackened as is usually the case. A tree is rooted in this dirt bed in the centre of the main north face of the wall. Small horizontal silicified tree trunks occur near the eastern end (at the ivy mound on the photographs) and also in the south face of the wall. The pebbles show some slickensiding ("slickolites") of the marl around them during the major compaction to which this, once thicker, bed has been subjected. Fine-grained, lagoonal-type, oolite. 0.25m. The uppermost 0.15m is yellowish-brown stained, a stain that is probably derived from the overlying Great Dirt Bed. This oolite is presumably the equivalent of the hypersaline, radial fringe oolite with gypsum pseudomorphs at the Fossil Forest, Lulworth (bed 8 of West, 1975). This is analogous to modern "quiet water oolites". Top Cap, part. 0.25m. Buff, splintery, laminated pelletoidal limestone. Top Cap, part. 0.44m. Laminated buff, splintery micritic and pelloidal limestone of low porosity. This bed has numerous small tubules of about 1mm diameter, largely filled with rhomb-type sparry calcite. They are particularly conspicuous on the top surface of this bed. There are minute cracks filled with calcite and some larger cracks which have a sedimentary fill of peloids and ostracod shells and fragments of shells. Dendrites occur on joint surfaces. Top Cap, lower part. Approximately 1.28m in thickness with some irregularity. 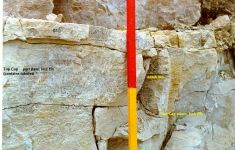 It is a massive, thrombolite-type (spongiostrate) stromatolitic limestone. The stromatolitic facies is continuous and it is mammilated or botryoidal in parts and here there is much porosity. In the pores there is much yellowish calcite as rhombs. Some of these reach 6mm in length and resemble Iceland Spar but are translucent rather than clear. This bed contains small tubules, that may of Chironomid origin. Like most of the stromatolite horizons in the Purbecks the bed is probably a clotted or grumeleuse micrite. 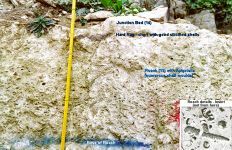 Fish scales occur in this bed in proximity to (beneath) botryoidal stromatolitic limestone. This is probably the bed that was the source of the fish remains found in loose blocks at the foot of the wall. Lower Dirt Bed. This about 0.11m thick, but very irregular with pockets of upto 0.13m thick and of about 0.35m wide. Between these the bed may be reduced to a very few cm. It is a dark greyish brown, carbonaceous marl, darker and with a higher carbonaceous content than the Basal Dirt Bed and speckled with small carbonate clasts. Cycadeoid tree remains have been found in this bed in the northern part of Portland (Bristow in Damon, 1884). At the Kingbarrow Quarries to the north of here, tree holes (moulds) occur in the overlying Top Cap and these sometime contain silicified wood. This shows this dirt bed to be a true palaeosol, although it does not have pebbles here like those of the Great Dirt Bed. Examined with the binocular microscope, it shows numerous white calcite and brown calcite nodules or clasts of about 2 or 3 mm diameter and of subangular to subrounded shape in a matrix of soft marl with scattered carbonaceous fragments. This plant debris is mostly about the size of small stems or twigs and is fragmented. Large carbonaceous remains were not seen. 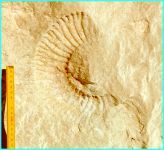 No fossils were recognised in the small samples examined. No large pebbles like those in the Great Dirt Bed occur. The acid-insoluble residue of a sample of this bed was examined. There is much clay in addition to carbonate. Otherwise the siliciclastic content was found to be very low, with just a small proportion of quartz silt being present and a few scattered larger quartz sand grains. Limonite, probably from the oxidation of pyrite is common. There are limonite pseudomorphs after aggregates of framboidal pyrite. Carbonaceous matter is conspicuous as small black fragments of vitreous appearance. No vertebrate debris was seen, either in the residue or the hand-specimens, but a large volume of material was not searched. The Lower Dirt Bed gives off a strong bituminous odour when dissolved in dilute hydrochloric acid. Skull Cap. 0.80m thick in general but very irregular in thickness. Massive, thrombolite-type (spongiostrate) stromatolitic limestone, mammilated or botryoidal in parts. The botryoidal parts are very porous and have rhombs of yellowish calcite on the surfaces. The top surface under the Lower Dirt Bed is brown stained and hummocky. The bed is not laminated. No cavities left by trees were seen here, although they are usually not present here but in the Top Cap above. The top part is irregularly granular. Hand specimen examination suggests that some ostracods might be present but this requires confirming in thin-section. Basal Dirt Bed. This is a laminated grey brown marl. It is of about 0.03 m in thickness but is very variable occurring in depressions upto 0.05m deep in bed beneath. It contains some small shell fragments, probably as a result of local reworking of the underlying bed or beds and some small calcareous nodules of a few millimetres. Some scattered carbonaceous matter is present, mainly as small ovoid bodies of a few millimetres, without obvious preserved structure. No limestone pebbles were seen and the carbonaceous content is less than that in the Dirt Beds above. It is not clear whether this was a true soil or a marsh sediment. It does not appear to contain gastropods that might suggest that it was of lacustrine origin. Junction Bed - Limestone showing transition from Portland facies with large molluscs to Purbeck facies either with small lagoonal molluscs and common ostracods or with stromatolites, little fauna and evidence of hypersalinity (pseudomorphs after gypsum etc.) . 0.24m. It can be divided on the basis of lithology into two parts but there is no parting and merely a transition between them. Junction Bed - Upper Part. 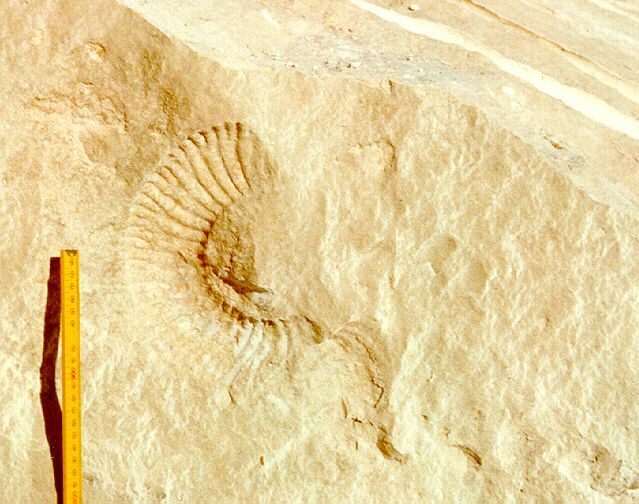 In the handspecimen this appears to consist of pelletoidal limestone of about 100 um particle size. Petrography: This has irregular ooids, with fairly large and irregular radial calcite rims, in a pelmicrite and dismicrite matrix. The matrix has numerous small pellet-like objects with light-coloured fringes. The origin of these is not clear. An interesting distinction from the lower bed is the common occurrence of ostracods. This bed more clearly presents the Purbeck lagoonal facies, seen distinctly for the first time when proceeding up the succession. There is some small quantities of algal material and some thin bivalve shells broken by compaction before final lithification. It contains miliolid-type foraminifera and some framboidal pyrite. Small calcispheres are present. This seems to be a lagoonal sediment, possibly with some caliche features. Junction Bed - Lower Part. In the field this appears as an irregular, patchy oomicrite/pelsparite with many moulds of small bivalves. There are also scattered large calcitic shells, probably of Camptonectes or an oyster. Petrography: In thin-section this is a poorly sorted oomicrite/pelsparite with intraclasts. The ooids are rather irregular with fairly thick radial calcite rims. There are small some gastropods (of Valvata size and some algal structures occurring within allochems. It has some very irregular porosity. A notable feature is some internal sediment with geopetal structure which seems to have partially filled cavities, some of them bivalve moulds. This demonstrates the early dissolution of aragonite so that Purbeck carbonate sediment could partially infill the cavities. It supports the rather obvious idea that the Roach was cemented early and lost its aragonitic shells during subaerial exposure in initial Purbeck times. Some of the apparently tubular cavities could have been developed by rootlets from the Basal Dirt Bed with lies above. The bed probably has a complex origin with reworked material from the underlying Portland marine limestones, some euryhaline lagoonal molluscs and, possibly, some caliche carbonate. Portland Roach. Oolite - buff porous oosparite (ooid grainstone), with numerous moulds of aragonitic gastropods and bivalves. It is 0.70 m thick here, the upper shelly limestone of the Portland Freestone or Winspit Member of Townson (1975). The matrix particle size is small - fine sand - 200 um, but to illustrate the sediment change the gravel size mode produced by the mollusc shells is plotted on the diagram (although undoubtedly the mean particle size resulting from averaging the very large number of carbonate sand grains and the much smaller number of large mollusc shells would be much smaller, perhaps in the medium sand range). This bed has very high mouldic secondary porosity, and having a relatively rough surface, as a consequence, has been used more for sea-defences than for building stone. The fossil content of the Roach of northern Portland is interesting. Everywhere the notable and obvious features are the cerithid gastropods, Aptyxiella portlandica the "Portland Screw", and trigoniid bivalves both of which are common as moulds. The faunal content is discussed further in the fossil section. Petrography: Unlike some of the lower beds this is good, clean, shell-rich oolite or oosparite. It is well-sorted with almost nothing but sparry calcite between the allochems. As is obvious in the hand-specimen, there is a high mouldic secondary porosity and the aragonitic shells have been lost in solution. There is also much inter-grain primary porosity retained. Calcitic bivalve shells are well-preserved. A surprising aspect is that micrite envelopes on these, although present are not large. Some algal borings can be seen and there is some partial silicification of the calcitic bivalve shells. Compound carbonate grains are common and chalcedony spherulite occur here and there in the allochems. Many of the ooids have shell fragments as nuclei and quartz sand grains are not generally present. Not all aragonitic material has disappeared in solution leaving a cavity. There is a little sparry calcite partially occupying the sites of some aragonitic material and some of the calcite is as rhombs, a common feature of the Purbecks above. The Hard Rag - WCW 13b.Localised nodules of chert at the top of the Roach and replacing to some extent the aragonitic and calcitic mollusc shells. This has been referred to as the " Hard Rag" and Townson (1975) commented that "nodular and tabular dark brown chert is common and in this the aragonitic shell structure of trigoniids and intra-ooid laminae is well-preserved. " The Hard Rag is very dark, greyish brown with coarse ooids (about 0.8 mm with some larger than 1mm) replaced by silica. The ooids clearly show a concentric structure and some are oval. A variety of replaced molluscan remains occur. These include small, Hydrobia-like gastropods. Some of the larger shells have been replaced by a bluish white variety of chalcedony. Some marine bivalves at the periphery of the chert nodules have not been replaced and are preserved as siliceous internal moulds. Shells in the Hard Rag have not been compacted. Whit Bed, part. Oolite - buff porous oosparite (ooid grainstone), with scattered moulds of aragonitic bivalves. Whit Bed, part. Oolite - buff porous oosparite (ooid grainstone) with bivalve shells. Medium sand size, 300 um with many moulds of aragonitic bivalves. Whit Bed, part. Oolite - buff porous oosparite (ooid grainstone), with few shells. Medium sand size - 300 um. Low angle, tabular cross-bedding is present with dip in a general south-westerly direction. This is the basal part of the Whit Bed. In the (not widely used) stratigraphical nomenclature of Townson (1975) this represents a bed within the upper part of the Winspit Member and that author commented on the general feature of planar erosional beds dipping southwest in this part of the sequence. A rippled surface is seen in section at the base of this bed in the western part of the wall. This is regarded as "Blake's Erosion Surface". Blake (1880) said that the Whit Bed was separated by unconformity, or at least, contemporaneous erosion, from the beds below. Curf and Chert, part. Oolite - buff porous oosparite (ooid grainstone), with some scattered chert nodules at the top. It has a particle size of about 375 um and is in the medium sand classification. This bed seems to be 0.38m thick at the eastern end of the wall. However, the lower units are not exposed here and, therefore, there is a small risk of miscorrelation. At the eastern end of the wall where the road descends to a lower level, this bed varies between about 0.58m and 0.70m. 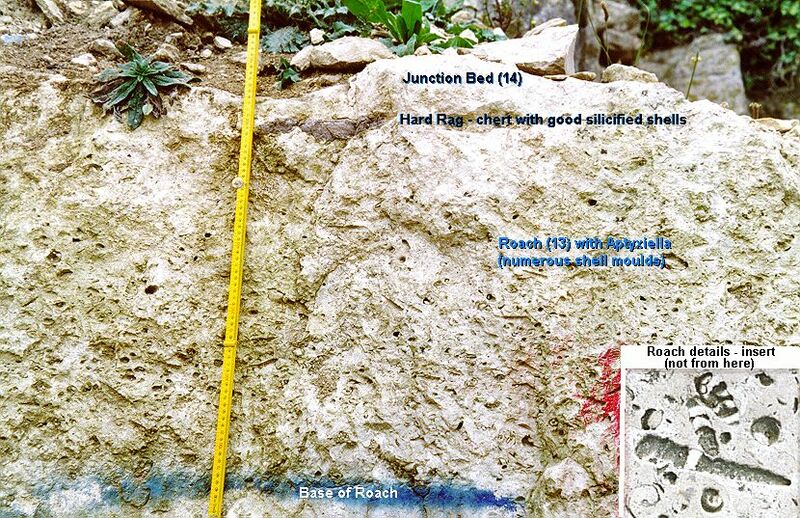 Long angle, tabular cross-bedding is a notable feature of this bed and may explain the thickness variations. Curf and Chert, part. Chert occurring as thin close-spaced nodules. The chert attains only 0.03m in thickness. It is otherwise similar to the other chert horizons below. Curf and Chert, part. Oolite - buff porous oosparite (ooid grainstone), with some chert nodules, particularly in the lower part. 48m in thickness. The particle size is about 375 um and it is, thus, of medium sand size. Curf and Chert, part. Chert as large, close-spaced nodules. Variable thickness, attaining 0.09m. It is similar to chert of bed WCW 4. Curf and Chert, part - Curf?. This limestone, a type of calcarenite is finer grained and whiter than the oolites above and below. It is 0.43m thick and of fine-sand particle size. Petrography: This fine-grained limestone has numerous small rounded bioclast fragments and intraclasts. There are some intraclasts with ooids within them, some large shell fragments with well-developed micrite envelopes and much fine broken bioclastic material. Some geoditid, Rhaxella sponge spicules are present but are not sufficiently abundant for the rock to be classified as a spicule wackestone. In such rocks the siliceous spicules have been replaced by calcite, thus freeing silica for the diagenetic formation of the chert nodules. Wilson (1967) and Townson (1971; 1975) and House (1993) have discussed such rock types which are common in the Portland Cherty Series. There are some small fragments of echinoderm debris with stereom structure and a section through an echinoid spine was seen. Spicules of the sponge Pachastrella occur, still in siliceous form. Bryozoan debris is common. Overall the rock is probably a fine intraclast and bioclast packstone or, using Folk's Classification, an intrasparite/biosparite. It may be related to the fine bioclast sand packstone shown by Townson (1975) in the middle part of this Winspit Member on the west coast of Portland. Curf and Chert, part. Chert, dark brownish grey, massive nodular chert. This is probably replacive as is normally the case but the fabric is not visible in the hand-specimen. Thickness is about 0.14m but the chert is irregular. This chert is better developed than the other chert horizons and almost continuous. Base Bed, part. Oolite - buff porous oosparite (ooid grainstone), with bivalve shells. 1.15m thick. The bed has a bituminous smell when broken. Aragonitic bivalves have been lost in solution but calcitic bivalves (oysters and Camptonectes ) remain. This bed consist of coarse oolitic sand, lightly cemented. Particle size is 750 um (0.5 phi). From 0.67m to 0.77m above the base of this bed is a " Trigonia " Bed . This consists of moulds of aragonitic shells in oolite of Myophorella and other " Trigonias" . Some are tuberculate and some are finely ridged. Paired valves occur and there are also preserved calcitic shells of Camptonectes in this shell bed. Above 0.77m the oolite is not so coarse grained and has a particle size of about 250 um. Bivalve moulds are common just under the chert and this is presumably a minor development of the Base Bed Roach (a unit up to 0.6m thick at Flew's Pit, south of the West Quarries according to Strahan, 1898). It is not known whether the 0.67 to 0.77m shell bed also corresponds to part of the Base Bed Roach. The Base Bed Roach or Little Roach is a "Trigonia" bed (Strahan, 1898) but Woodward (1895) has recorded a " Cerithium" from it at Steward's quarry, Kingbarrow. Aptyxiella has not yet been seen in Withies Croft Wall at this level. Petrography: This oolite has large ooids with a matrix that includes scattered quartz sand grains of about 200 um greatest dimension, that is of fine sand size. There are numerous micrite-coated shell fragments, some with a prismatic calcitic fabric, others originally of aragonite which has been lost in solution and now occupied by sparry calcite. Endolithic algal borings show that there was micrite envelope development before the major micritic coating was added. The rock is not a simple oosparite but between the large ooids there are small peloids, some scattered micritic material and some sparry calcite, in some cases in the form of rhombs. The possibility of the presence of some dolomite has not been eliminated. Some small fragments of echinoderm material with stereom structure were observed. These are important in showing that salinities were near those of normal seawater. A small phosphatic tooth was seen in section. Compound ooids were seen. Concentric structure is visible in the ooids but is not well preserved and often there is merely a general micritic appearance. Some bryozoan debris was observed. In all the rock is a poorly sorted oomicrite/oosparite with some quartz sand, peloids and much bioclastic, mainly bivalve, debris. Base Bed, part. Oolite - buff porous oosparite (ooid grainstone), with calcitic bivalve shells and moulds of aragonitic gastropods and bivalves. This is of medium sand size with grains of about 400 um. Bivalves include oyster-like calcitic shell fragments (possibly of Camptonectes ). There are some larger Camptonectes at the top. Although there are some paired bivalves this is mainly a death assemblage (thanatocoenosis). The bed is 0.15m to 0.24m in thickness with localised depressions 0.20m wide where the bed reaches its maximum thicknesses. These depressions are presumably scours filled with shelly oolite, and probably the result of storm activity. A tempestite origin for the bed seems likely. Base Bed, part. Oolite - buff porous oosparite (ooid grainstone), with a few bivalve shells. White to buff in colour, weathering grey. Medium sand size - 400 um. The thickness at the south-western end of the wall is greater than 1.5 m. This is the lower part of the Base Bed. The Cherty Series is seen in the nearby Admiralty Quarry and this presumably lies almost directly above it. The total thickness of the Whit Bed seen here at Withies Croft Wall is 2.85m. which is similar to a figure quoted for Kingbarrow Quarries (2.59m) according to Bristow in Damon (1884) and to figures (1.8 - 3m.) given by Woodward (1895) for Steward's Quarry at Kingbarrow. It is, therefore, likely that the top of the Cherty Series is at road level at the south western end of the wall. This is at about 103m. above OD as shown on the 1:500 detailed survey by Environs Partnership and Graham Garner and Partners Ltd. (1996). This height is compatible with more general height data above OD on the Ordnance Survey maps (Ordnance Survey, 1:25,000 Weymouth and Portland, Sheet SY 67/77, Pathfinder 1343 and also the 1:10,000 map). The oyster accumulation in the central part of Withies Croft Wall, within the Whit Bed is of a type described briefly by Townson (1975). He stated that " local oyster " patch reefs" are present in situ up to 2m high and 20m long. He referred to a location where one is present at SY 69137235. This is less than a kilometre from the Withies Croft Wall example and lies just west of the main north-south road. An ammonite, probably Titanites is seen in a newly quarried block from the Portland Freestone at the western end of the Withies Croft Wall. Townson (1975) noted that the characteristic fossils of the Roach are Laevitrigonia ("Trigonia"), Isognomon, Aptyxiella and Solenopora (a red alga), in a current deposited grainstone matrix. Blake had earlier (1880) reported that the Aptyxiella portlandica is confined (almost!) to this bed. Sowerbya dukei and rare Buccinum naticoides also appear to be peculiar to the Roach but are much rarer. Laevitrigonia gibbosa, Lucina portlandica, Camptonectes lamellosus, Ostrea expansa and Natica elegans it retains from earlier times. The large cockle,Protocardia dissimilis appears to have died out at this level (but the small euryhaline cockle - Protocardia purbeckensis comes in the lagoonal Purbeck Formation above). Horizontal tree remains in the Great Dirt Bed, replaced by chalcedony. This fossil wood is near the eastern end of the Wall at about station 15E. The silicified timber is orientated in the direction 301 degrees (true bearing). 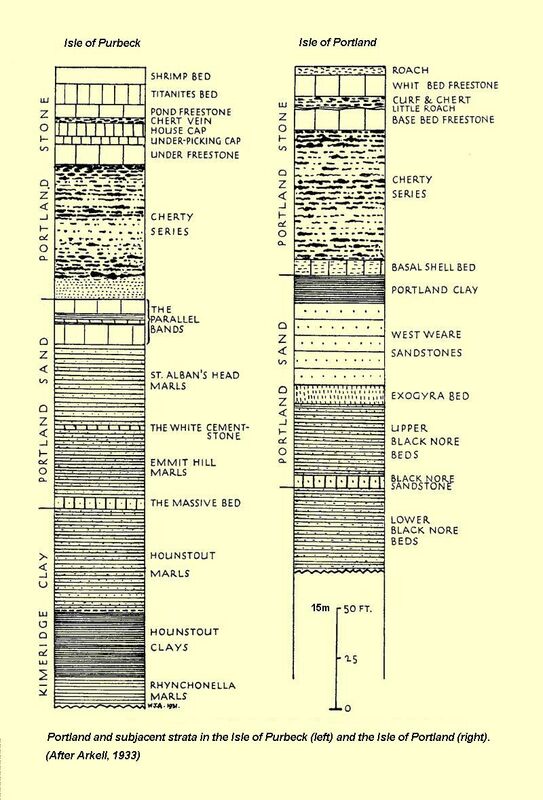 The origin of the facies of the Portland Stone is explained in this classic schematic diagram of Townson (1975). 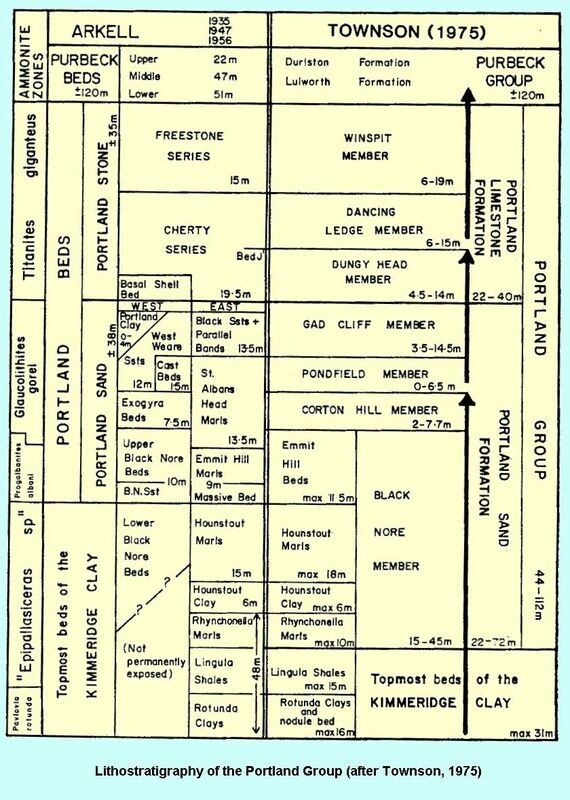 This very useful contribution to the understanding of the Portland Group shows, for example, the relative position of the ooid shoal that gave rise to the Whit Bed. Walther's Law (a widely used principle of modelling vertical changes in lithology in terms of lateral changes in environment) has been used to produce this model. It is not necessarily the case that all these facies were developed to a near equal extent at any one time. The basal Purbeck facies shown here covered almost the whole region at one stage. Nevertheless, this is a good method of understanding the general origin of the facies. At Withies Croft Wall the main facies changes are between the ooid shoal (Whit Bed and Base Bed), the shell sand area in front of the shoal and fine shell sand (Curf and Chert). The setting of patch reefs are also shown. I am particularly grateful to Mr M. Poultney, Director of Albion Stone, for arranging this geological survey and kindly providing ready access to the Withies Croft Wall. 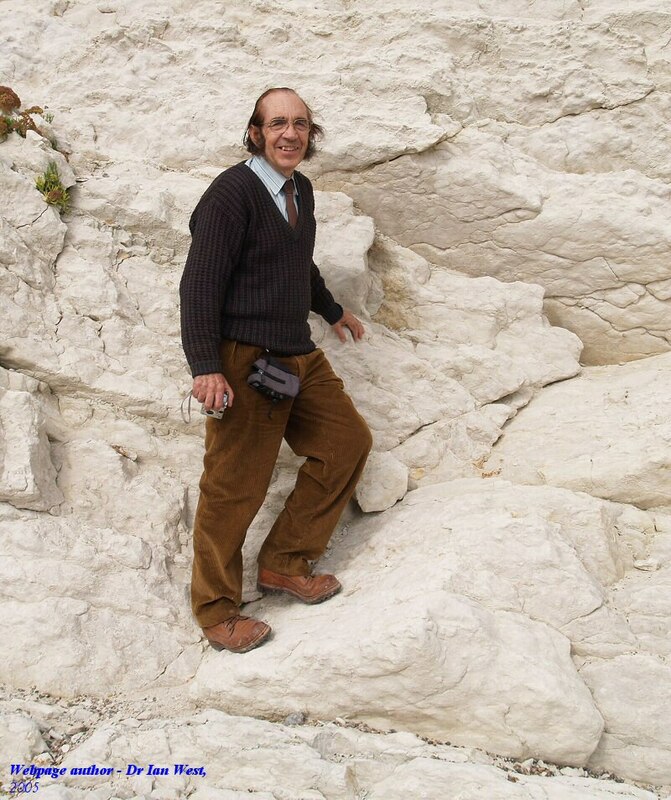 Mr Mark Godden, the Quarry Manager at the quarry on Portland, has provided valuable help in the field with advice and information on this geological section. Jo Thomas of the Dorset DIGS group has helped greatly in the early stages and I acknowledge the assistance and organisational work of English Nature, particularly Victoria Copley and Andy King. I thank Bob Jones and John Ford for making the thin-sections. Arkell , W.J. 1947. The Geology of the Country around Weymouth, Swanage, Corfe and Lulworth. Memoir of the Geological Survey, 386 pp. Explanation of Sheets 341, 342, 343, with small portions of Sheets 327, 328 and 329. By W.J. Arkell, M.A., D.Sc., with contributions by C.W. Wright, M.A. and H.J. Osborne White, F.G.S. London, Published by Her Majesty's Stationery Office, 1947, reprinted 1953. 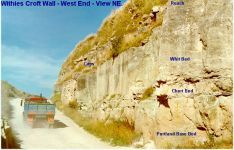 This publication provides general information on the Portland and Purbeck succession of the Isle of Portland, but does not deal with Withies Croft Wall specifically. Blake , J.F. 1880. On the Portland rocks of England. Quarterly Journal of the Geological Society, 36, 189-236. With notes and descriptions of Portland fossils and comparative sections of the Portland rocks of England. By the Rev. J.F. Blake, M.A., F.G.S. See pp 190 -193 on the Isle of Portland (not highly detailed regarding the Isle of Portland but with information of Swindon, Vale of Wardour and elsewhere). Damon , R. 1884. Geology of Weymouth, Portland, and Coast of Dorsetshire, from Swanage to Bridport-on-the-Sea: with Natural History and Archaeological Notes. New and Enlarged Edition (2nd Ed. ), Weymouth, R.F.Damon, London, Edward Stanford. 250pp. 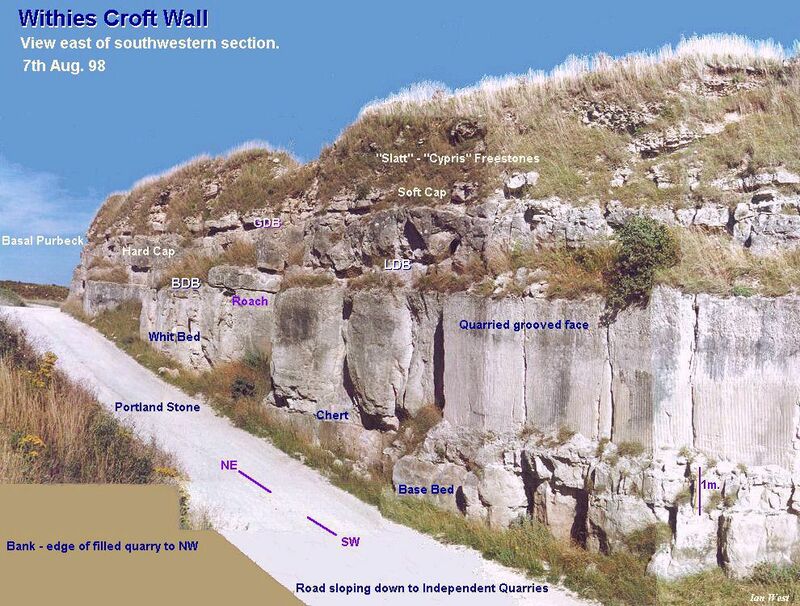 Details of old Portland quarry sections in the vicinity of Withies Croft Wall are included. Environs Partnership and Graham Garner and Partners Ltd. 1996. Withies Croft Quarry: Mineral Planning Application, Existing Survey For Albion Stone Quarries Ltd. Detailed, close-spaced topographic contour map at scale of 1:500 with contours at 1 metre intervals. Environs Partnership, Landscape Architecture Environmental Planning, The Old Rectory, South Walks Road, Dorchester, DT1 1DT, Tel. 01305 - 250455. Graham Garner and Partners Ltd. Arrowsmith Court, 10, Station Approach, Broadstone, Dorset, BH 18 8AX, Tel. 01202 - 697341. Drawing Number 284/4. Date 25.04.96. Drawn by DJR. The map shows little except the contours and an individual grid reference system and has no text on the map except contour heights. It is exceptionally detailed, though, and covers Withies Croft Wall, parts of the playing fields to the south and the southernmost margin of the deep Admiralty Quarries. Albion Stone address - Albion Stone, First Floor, 27-33, Brighton Road, Redhill, Surrey. House , M.R. 1993 (and earlier edition in 1989). Geology of the Dorset Coast. Geologists Association Guide No. 22. 2nd edition, 164 pages plus plates. ISBN 0 7073 0485 7. Nature Conservancy Council . 1987. Citation Sheet, County Dorset, Site Name - Isle of Portland. Site of Special Scientific Interest ( SSSI) notified under Section 28 of the Wildlife and Countryside Act 1981. (As amended). Ordnance Survey Map , 1:25,000 Weymouth and Portland, Sheet SY 67/77, Pathfinder 1343 (see also 1:10,000 map). Strahan , A. 1898. The Geology of the Isle of Purbeck and Weymouth. Memoirs of the Geological Survey, England and Wales. London. 278pp. Published by Order of the Lords Commissioners and Her Majesty's Treasury. Price 10 shillings and 6 pence. Printed for Her Majesty's Stationery Office, by Wyman and Sons, Limited, Fetter Lane, EC. With coloured map, cross-sections and a bibliography of books, papers and maps by W. Whitaker, F.R.S. (1761-1873) and by A. Strahan, M.A. (1874-1898). 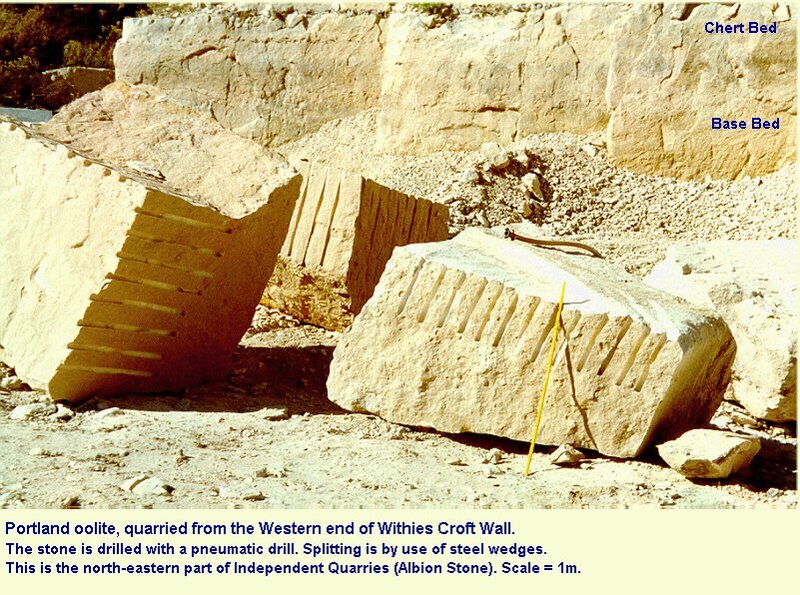 This includes details of old Portland quarry sections in the vicinity of Withies Croft Wall. Townson , W.G. 1971. Facies Analysis of the Portland Beds. Unpublished. D.Phil. thesis, Oxford University., 284pp. Townson, W.G. 1975. 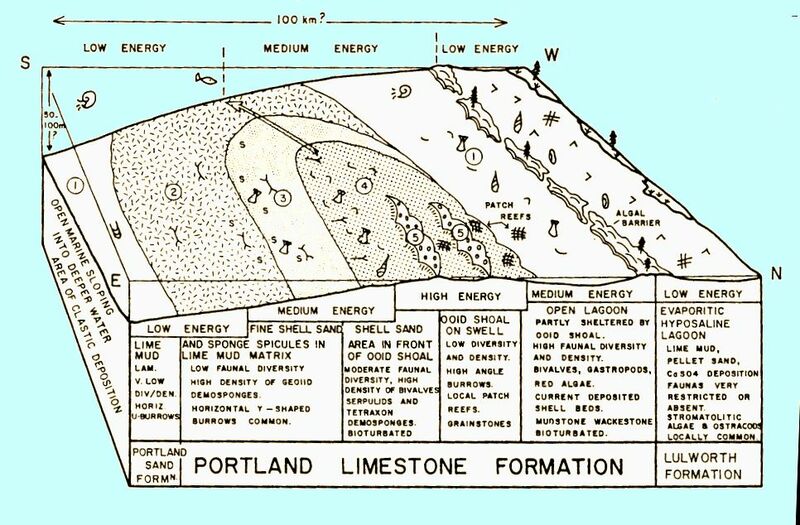 Lithostratigraphy and deposition of the type Portlandian. Journal of the Geological Society, London, 131, 619-638. West , I.M. 1975. Evaporites and associated sediments of the basal Purbeck Formation (Upper Jurassic) of Dorset. Proceedings of the Geologists' Association, 86, 205-225. 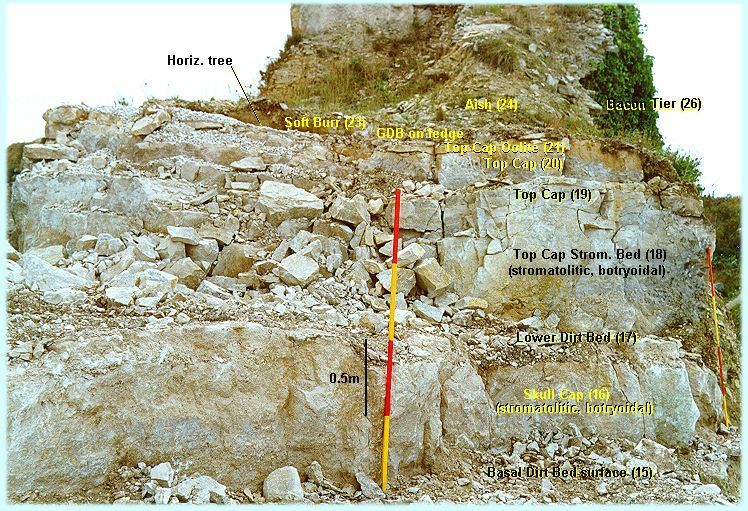 This provides a section of the lower part of the Purbeck succession of Perryfield Quarry with a record of the occurrence of the basal Purbeck evaporite facies in a thin development as the Aish. It provides useful comparison with the Withies Croft section. West, I.M., Shearman, D.J. and Pugh, M.E. 1969. Whitsun field meeting in the Weymouth area, 1966. Proceedings of the Geologists' Association, London, 80,331-340. Wilson , R.C.L. 1967. Diagenetic carbonate fabric variations in Jurassic limestones of southern England. Proceedings of the Geologists' Association, London, 78, 535-554. Woodward , H.B. 1895. The Jurassic Rocks of Britain. Vol. 5. The Middle and Upper Oolitic Rocks of England (Yorkshire excepted). Memoirs of the Geological Survey of the United Kingdom. 499pp. Neale , A. 1852. Note on fossil bones at Portland. Quarterly Journal of the Geological Society , London, 8. Callomon , J.H. and Cope, J.C.W. 1995. The Jurassic Geology of Dorset. In: Taylor, P.D. (ed.). Field Geology of the British Jurassic. Geological Society, London, pp. 51-103. Quest , M. 1985. Petrographic and Geochemical studies of the Portland and Purbeck Beds of Dorset. Unpublished Ph.D. Thesis, Geology Dept., University of Birmingham, England, 347pp. Wimbledon, W.A. and Cope, J.C.W. 1978. The ammonite faunas of the English Portland Beds and the zones of the Portlandian Stage. Journal of the Geological Society, London, 135, 183-190. West, I.M. , 1975. Evaporites and associated sediments of the basal Purbeck Formation (Upper Jurassic) of Dorset. Proceedings of the Geologists' Association, 86, 205-225. Wimbledon , W.A. 1987. Rhythmic sedimentation in the Late Jurassic-Early Cretaceous. Proceedings of the Dorset Natural History and Archaeological Society, 108 for 1986, 127-133. [Most of this paper is on the Portland Group. An Appendix refers to Purbeck nomenclature.] Abstract: A number of shallowing and deepening phases is described in the late Kimmeridgian - Berriasian interval. Eleven deepening / transgressive events are noted in the most complete Dorset section. 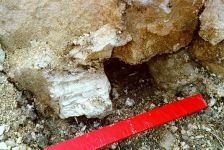 A preferred lithostratigraphy for these beds is compared to previous lithostratigraphy, and "event correlations" are critically examined. Copyright © 2017 Ian West, Catherine West, Tonya Loades and Joanna West. All rights reserved. This is a purely academic website and images and text may not be copied for publication or for use on other webpages or for any commercial activity. A reasonable number of images and some text may be used for non-commercial academic purposes, including field trip handouts, lectures, student projects, dissertations etc, providing source is acknowledged.